When Should Your Children Start to Save? I bought my little girl her first ever piggy bank the other day. As she is only 3 years old I have no real intention of encouraging her to start being frugal just now. However, we went on a trip the other day and she was taken by a piggy bank with a fancy design on it. It’s now filled with sweetie wrappers, a few foreign coins and who knows what else. However, the very fact that she now has some sort of savings mechanism made me wonder when we should start to encourage our children to save money. Here are some of the best ideas I could come up with. If I cast my mind back to my teenage days I can remember earning a few pounds here and there doing odd jobs for neighbours and relatives. Of course, I wasted all of the cash I earned on rubbish Spectrum games, tooth-rotting Caramac bars and editions of the Beano. If I had started saving back then I wouldn’t be a millionaire by now but I would have learned about the benefits of saving a bit earlier. As it was, no one in my house really had a habit of saving money and when I started working full time it took me a couple of years to get into the habit of doing this. I think it would also help a kid feel good about themselves if they start to put away a little bit of what they earn each time they have money. To be honest, I’m dreading the day my daughter starts to hit me with ridiculous demands for smart phones, designer clothes and Lord knows what else. I’m pretty sure that the kids of today aren’t happy to settle for a bar of weird flavoured chocolate and a vaguely amusing comic. At the moment I can fob her off with cheap toys and books but before long I’m sure she will be able to tell the difference between a plastic fake phone that cost a pound and a Samsung blooming Galaxy. At this point I reckon that it might be a good idea to suggest that she finds a way of saving some money each month in order to afford these not-so-little luxuries. If you give your kid some sort of monthly allowance then it shouldn’t be impossible for them to put some of it away each time. This will prove how much they really want something and will make it all the more satisfying when they finally get their hands on the object of their dreams. As I mentioned earlier, no one in my family really had a savings habit when I was growing up. This wasn’t a problem for me and it meant that I chose the moment to begin saving money? Was this a good thing and is it something we could use with our own children now? I think there are both good and bad points to taking this approach. In terms of the benefits, it means that the youngster starts saving on their own terms and when they really want to. I am pretty sure that this means that they are likely to put in more effort and make a better job of it as well. On the downside, it could be that many kids are just like I was and simply never think about saving money. I think that if the idea had been explained to me when I first started earning money and wanting expensive things I might have been hooked on saving money from an earlier age. Do you have any opinion on when your children should start to save? 20 Responses to When Should Your Children Start to Save? Good tips. I think the sooner the better. Obviously, they have to grasp the concept of money first. I very specifically remember my Dad coming home from work and emptying the change out of his pockets. My sister and I would then go and deposit the change in a massive Crayola crayon bank. When it was filled we sat down and counted the money (as in my parents counted it)… I don’t remember what we spent that money on or anything.. but I think that is my earliest memory of money and saving money specifically. I believe children should be taught how to save as early as possible, so that they would know how to value money early in their lives and avoid getting into debt when they grow up. I’m already trying to teach my daughter about money by letting her handle coins and pay the shop keeper etc! She’s 3 years old. I think allowing children to save money from an early age would help them to develop the right mindset about money in the future. Getting them to save for the expensive things that they want e.g smart phones would mean that they start forming ideas of how much things actually cost. It would help them to make their own decisions as to whether the item is worth the time it would take for them to save for it! I was encouraged to save a lot as a child, but the advice just fell on deaf ears! That’s not to say it was a waste of time, as my parents were just trying their best and at least now (finally) I understand the value of what they were trying to achieve – better late than never – as some people will spend their entire lives unable save. I like the idea of teaching them to save as soon as they have the capacity to learn the value of money. One way to do that is to agree to pay half for an item they covet. By forcing them to save half for something, vice simply paying for it for them, during the time it takes them to save the money, they can give real thought to is it something they REALLY want and if it is worth sacrificing all the other things they could be doing with the money. My parents had be starting to save at a very young age. I had a paper route when I was 10…and got a check for $5.35 every two weeks. $3 had to go in the bank. We haven’t been quite as stringent with my son. He ‘saves up’ for things in his wallet, and then buys them. We also suggest he put a part of large gifts (birthday, Christmas, confirmation, etc) into his savings account. Not only did that teach me to save but it also taught me the value of earning the money. So I would say the sooner the better! When you’re minimising your expenses and working those late nights to maximise your savings you really start to understand the value of each month. I’ve just started my career out of uni and I wish I had started saving 3 years ago when I had the chance to make some extra dosh! Learning as early as possible is super important. Nice article i must say ! 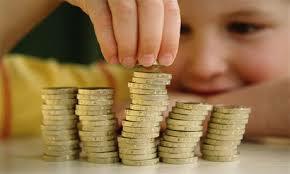 Children becomes more smart they save money and less amount of expenses. Now a days childrens want to earn money very fast. In face a scheme known as The Fiver Challenge has just been created which loans £5 to primary school children in an attempt to encourage them to set up their own business and make a profit.